I sew nearly all of my running gear. Why?! Several reasons: I want a better fit than I can get in ready-to-wear stuff. The nicer quality activewear I covet is much too expensive for my budget. Plus I love crazy, loud running clothes-- for the fun of it and for high visibility & safety for the my urban running. I'm not a fast runner by anyone's standards (but who cares!!) and have not been a super long distance runner but am starting to train for a half marathon in late spring! Making my own running clothes is a huge motivator for me... I sew a sassy new pair of leggings or top, then I just have go out for a run to try them out. I sewed up three long-sleeved tops and a pair of tights. 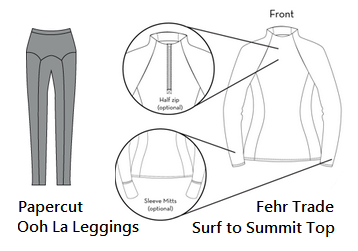 I used the newly released Surf to Summit Top pattern from Fehr Trade along with the Ooh La Leggings pattern from Papercut. I've sewn every single one of the Fehr Trade patterns (& have been a pattern tester for every single one but actually was not a tester for this particular ladies top) but I muslined it all out first. A few weeks ago Fabric Mart had a wildly amazing sale on a bunch of New Balance fabric found in their Activewear category so of course I ordered (almost) every color. I used a bold pink from my order for my muslin and some purple and brown supplex bits I had in my stash for the mitts. I made a size small then graded to a large at the hip. I also added 1 1/2" to the length of the hem. I found the underarms to be cut pretty high for me and went ahead and cut out 3/4" to lower it some. I've run and hiked in this pink version and the high underarm didn't cause discomfort, but I felt like there was just a small amount of excess fabric bunched up under there. You can see in the picture below how I removed that wedge from the pattern pieces. My second version is in the shocking citron. I added in piping on the vertical seams in a dark pink. Both fabrics are that New Balance stuff. It's a polyester/lycra blend and is super stretchy with excellent recovery. I've run, hiked and washed all of these tops a couple times each already with zero shrinkage and no weird stretched out parts. It is a wicking fabric perfect for sweaty activities but I found it to not keep me really warm in below freezing temperatures. I've paired these tops with a fleece vest and it was perfect for the low 30s. In a side by side comparison to some knit Supplex fabric I have, they are basically identical. My third Surf to Summit top is a solid grey New Balance fabric I picked up from Fabric Mart when I was in their brick & mortar store in early fall. I *wish* I bought more of it!! It's heavier weight and has a very soft wicking back. And for the crazy tights. I cut a medium waist and graded to an large below that. The legs on the pattern are SUPER long, I hacked off 4" from the hem and I'm 5'8" without shoes! I blogged about my first pair about a year ago on my blog here. The black & white print is nylon/lycra paisley peacock print actually from the swimwear category. It has no wicking properties what so ever, I'd steer clear of this sort of material in really sweaty, hot activity... but for running in colder temps at distances under say five miles, it's no problemo for me. I used more of the the dark pink New Balance fabric (the same color as the piping on the citron top) for the upper part of the tights and piping on the seams. I've actually never done a piping like this before and just improvised a very simple technique. I cut 1" wide strips long enough to cover the lengths of the seams. I then folded it half, pinned it to the edge of the seam and then joined my seams as usual with my pattern pieces. I use a serger for all my seams. I prefer to use Maxi-Lock Stretch Thread for my activewear serging-- it's soft against the skin and has a "fuzzy" quality like a yarn. I steer away from the regular cone thread for this sort of sewing, that stuff is great for my woven fabrics. Another interesting thing to note, the elastic to use in the waist of a pair of tights. I've tried both non-roll and knit... I have a great affinity for the knit one-- it's very soft, more stretchy and moves much more comfortably than the stiffer non-roll elastic. My husband was super sweet and took a couple photos of me in action. I wore the pink one hiking last weekend... it was so nice to have the mitts when the sun was starting to go down below the tree line. The photo on the right is moments after my New Year's Day 5k around my neighborhood. Don't look too close, I was a little sweaty. And P.S. I was at a New Balance store earlier today-- one long sleeved running top comparable to mine cost *more* than all the yards of fabric I got to make my own! Yeah, seriously. And it was very likely the same fabric. I always think about doing stretch piping like this when I'm doing active wear, then I always forget! After, I've sewn together a few pieces, I remember. By then, there is no way, I'm ripping out seams and cutting strips of piping!!! Love all of these! Thanks for the tip on the thread and the elastic. The piping is a really nice touch! Love this post! I've always wanted to make workout pants, I tried once with a regular leggings pattern and it was a total fail. All your gear looks so lovely. Thanks for sharing. Oooh. Thank you thank you thank you for this post! I have some amazing active wear fabric from Fabric Mart that I received in a bundle and really want to try making some cozy comfy pants, and I love all the tricks and ideas you have here. Love all of them! I think I'm going to make a fully citron top, it's such a fun color, and yes, this fabric is super super soft. Glad to read it holds up after a few washes. Did you get the pattern (from Papercut Patterns) as a download or by mail and if by mail, how long did it take to receive it? And how difficult were the pants to make? Thanks for some inspiration! Sorry for the super slow response!! Yes, I did get the paper version by mail. I've had it for a couple years (about that?) and feel like it took about a week and a half to get to me in the US here in Maryland. I was just wondering where you use the Maxi-Lock Stretch thread on your serger. Do you use it just in the upper and lower loopers or in the needles too? I would think coverage from the upper and lower loopers would eliminate any chaffing to the skin. TIA for your advice. Judy-- I use the Maxi Lock Stretch thread in all four loopers on my serger. Regular polyester thread has no stretch at all while the maxi lock stuff will allow for more comfortable movement as well as comfort against the skin. I've made activewear in the past with just the regular cone thread and it feels a little more "tight" in a way, it's just a thing I can feel as I move. You can experiment and see what you prefer for sure.